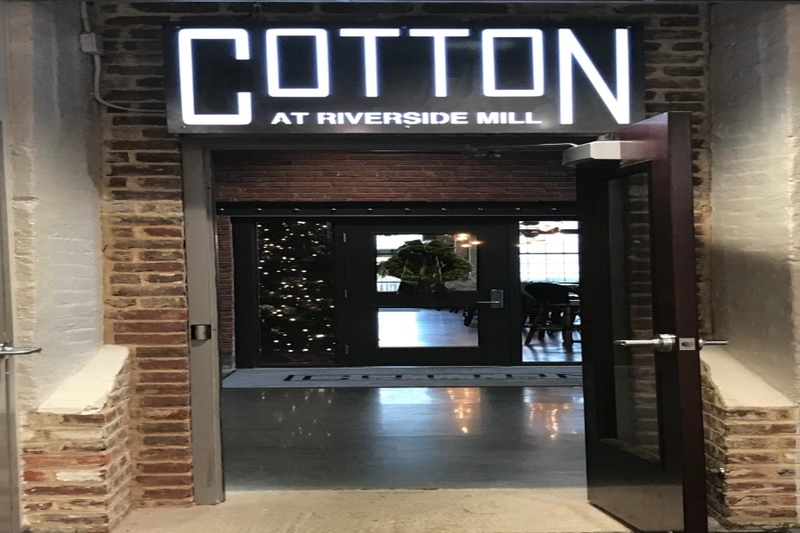 On Sundays at 11 a.m. to 3 p.m., Cotton serves a special brunch menu. Being in the atmosphere during the night is completely different than going in the late morning to mid-afternoon. I arrived approximately at 11:30 a.m., (but I have been there after church) and the crowd is relatively low, considering other restaurants during this have a long wait times. Now to the important part: the food. Everything sounds scrumptious on the brunch menu, but I sadly could not purchase it all. Instead I made a conscious decision to pick two items I thought sounded the most promising: The Mill ($11) and the Oven-Fried Frittata ($10). Cotton’s breakfast pizza, The Mill. 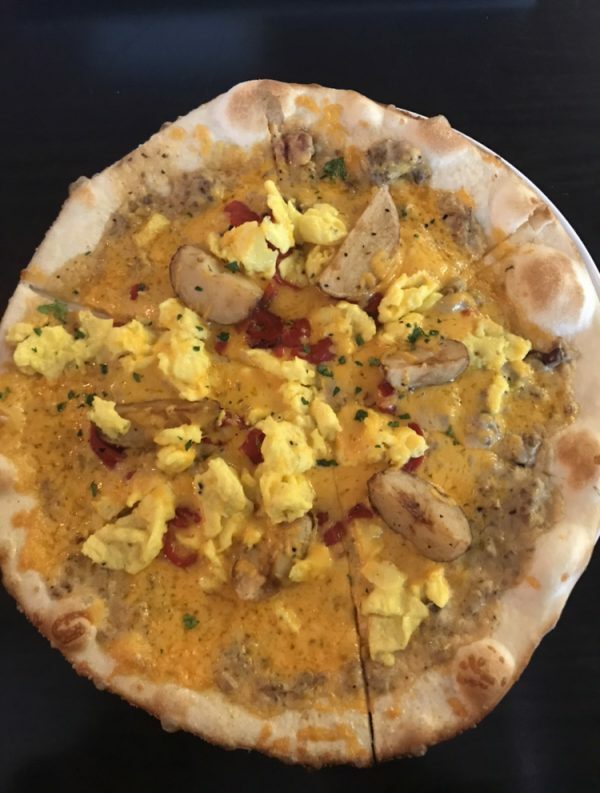 At first I was a little skeptical of having a breakfast pizza, but it turned out being a mouthwatering concoction of pure brunch. The cheese and gravy worked excellently together causing a nice gooey bite, and the eggs and potatoes made a wonderful topper on the pizza. I am not a big fan of onions, but I really enjoyed this dish. With all the other ingredients in the frittata, the onions seemed hidden with amazing flavor. 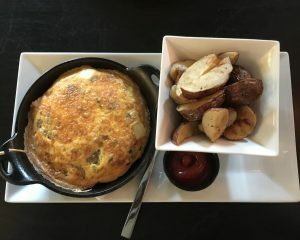 Though the frittata was bursting with flavor, the dryness of the egg made me not enjoy it as much as The Mill pizza. The service is superb. The wait staff is quick on their feet, the chefs are diligently fast, the hosts are very accommodating, and everyone is all-around polite. night like the starters, entree salads, and, of course, the fried Oreos (plus all other deserts). The overall experience was enjoyable, and the prices were inexpensive for a nice restaurant. 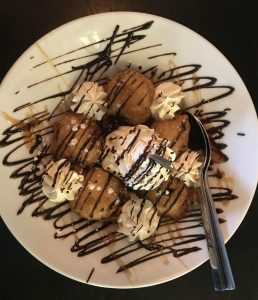 I highly recommend going to Cotton after church on Sundays for their brunch, as the Cotton is a nice restaurant to treat the family with without breaking the bank. For the list of the full menu, click the links for brunch and dinner. The entrance is through Spectrum since the flooding damaged the regular entrance, but it is labeled well with Cotton signs.